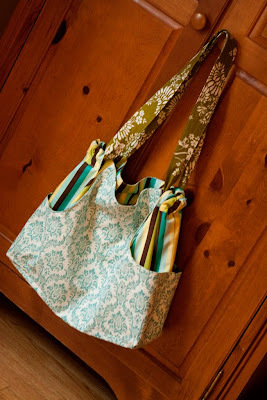 It's another bag from the Anna Maria Horner multitasker tote pattern! 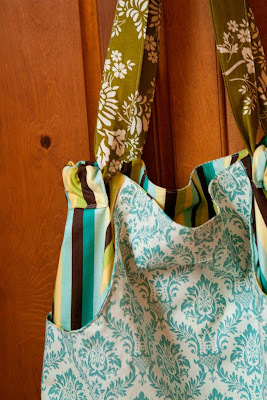 It's made of some pretty blue damask, striped pockets and lining, and green floral handles. The outside sports 4 pockets and the inside, two. 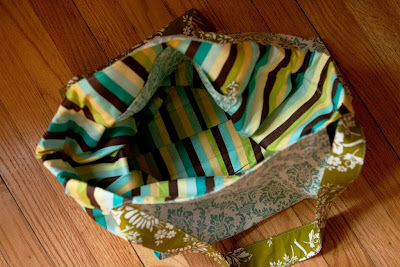 It could be a great gym bag, diaper bag (possibly, unless you like yours to close, then, no, because this one doesn't close), multipurpose bag, or as my friend Mary has planned, a nice knitting bag! I actually like this one better than the last one I made, but I took myself out of the running (although I WAS one of the first 100 followers) because it seemed to defeat the purpose of having a giveaway in the first place if I actually won it. In case you are wondering, I took the first 101 people and eliminated me. My husband is still in there though. Maybe if he wins, he'll give it to me! Okay, he's not going to win either. I better just make myself another bag. So, tonight, sometime after 9:00 PM Eastern time, winner. Right now, lots of other projects! Until tonight! The bag is beautiful. I love the fabric combinations. Yay on breaking 100 followers! not sure if my comment saved so trying again! Ooooohhhh!!! I have been excited for your giveaway! I would love to win this bag. I could totally use this as a diaper bag, because I will be having my 3rd baby in the summer, and could really use a snazzy bag!! I will keep my fingers crossed and check back later to see if I am the lucky winner!! That is such a great bag! I hope I win! On no, do I count? I singed up to follow when you said you were getting close, but there was already 101 followers! I didn't realize until recently that following someone didn't mean that you put them in your google reader! Well, it's a great purse. Super cute purse, thinking of making one like it for a diaper bag / purse. Such a lovely bag, I wish I win! awww, am I too late to enter? AWE SCHUCKS! I missed it!